I am glad that I am still working on the project. We had great discoveries in week 10 that the noise at certain frequencies I mentioned in last report came from the power supply of FPGA. We tried to use a paper box to attenuate the noise from the air, but only to find that the intensity of that certain noise didn’t fall down proportionally as we expected, which means the noise was not from the air. Then we probed the upper board where the microphones are thoroughly to look for the source of this noise. The result shocked us because the noise was from the power. Consider the lower FPGA board provided the power of the upper board, we believed the noise was from FPGA. The further experiments proved our suspect. Actually, the noise was from the power supply of FPGA. After this important discovery, Mr. Richter Ed decided to replace the FPGA board with the more advanced NI Elvis II platform to provide the power of the upper microphone board. And it works! Though we only replace for one out of four boards, the noise was gone and the SNR reached almost the estimated value. With the excitement and the encouragement our new discovery brought to us, we entered week 11. Since all the simulations work as we wish, Mr. Richter asked us to proceed with real world tests. To make the result more accurate, we firstly make a record with a single sound source. The purpose of doing this is to calculate the current lagging timetable, i.e., the current relative positions of 16 microphones. Then we played 2 audios via cellphones from different direction and make records for before-process effect and after-process effect. The comparison results are really encouraging. Though only 16 microphones were involved, we could apparently tell the differences between two records. The beam formed sound from the presumed facing direction was much clearer than the not-beam-formed sound from the same direction under an environment where there was another interfering sound source at a different direction. By now, I could draw a line and encapsulate my project! I had really struggling time with the project in these two weeks. Since we had already achieved real-time DOA detection before, I was supposed to testify the effectiveness of the beamforming algorithm with real time data. For the convenience of the verification, I recorded a new audio with a 4000Hz sinusoidal signal, naming the file ‘uPhoneArray_LoudSignal.bin’. Assuming that background noise is white Gaussian distributed, beamforming based on a 64-microphone array could theoretically raise SNR by roughly 18dB, which has been proved mathematically and under simulation environment (See Pic. 1). However, the result (See Pic. 2) from real data was so disappointing that Mr. Richter Ed and I got stuck to this problem for two weeks. We recalculated the theoretical improvement on SNR, tested the accuracy of Matlab code function by function, block by block and adjusted the way we computed SNR. Everything seemingly worked correctly except SNR. By the end of the 6th week, we were still not able to pinpoint the conflict. Amplification difference among 64 microphones, non-while-Gaussian-distributed noise, the approach to gain signal and noise power, the DC component in signal and so on may all result in the deviation from theory. Pic. 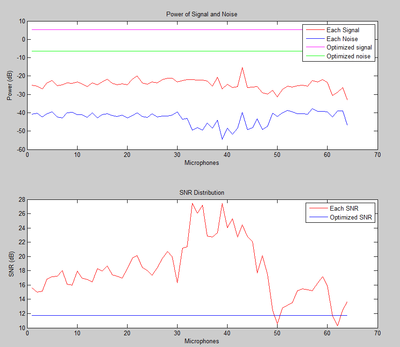 1 - Simulation: From the upper subplot, the power of signal is improved by 36 dB and the power of noise is improved by 18 dB. 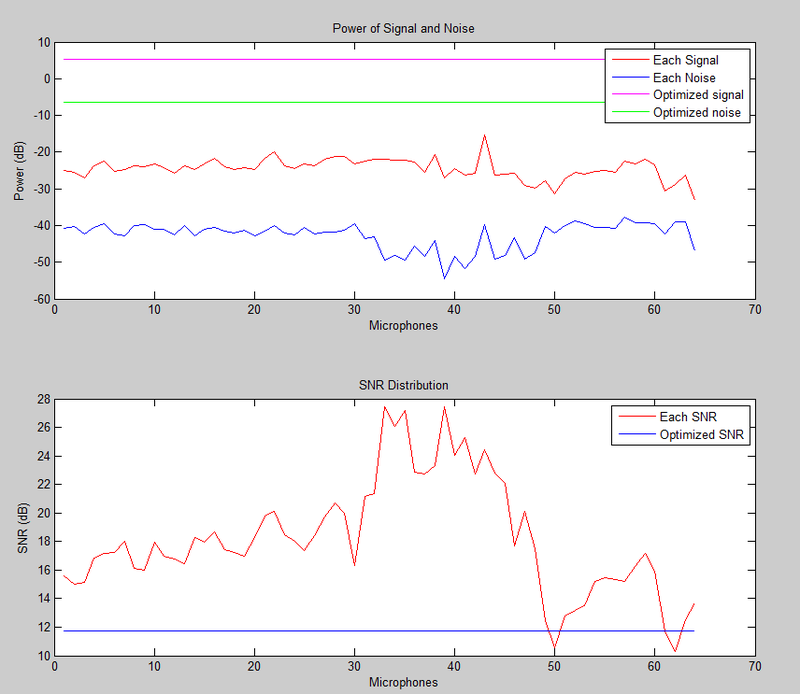 From the lower subplot, the SNR is improved by 18 dB. Pic. 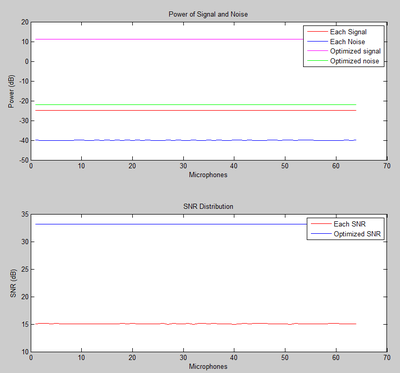 2 – Real data: From the upper subplot, the improvements on power of both signal and noise are much less than respectively 36 dB and 18 dB. 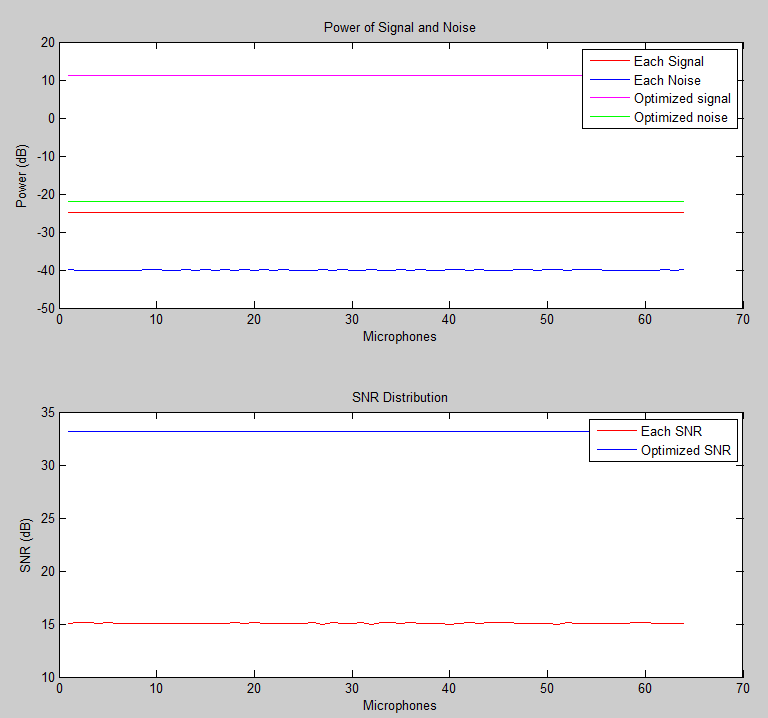 From the lower subplot, the SNR for each microphone varies greatly and the SNR of beamforming-adjusted signal is worse than that of the majority of microphones. The task for week 3 is to go further to see whether it is possible to speed up the algorithm a little more and make it real-time. As suggested by Mr. Richter Ed to try to connect computers in the same lab as to improve the computation ability, Luting and I made big changes on Matlab code so that finally computers in the same lab could be connected using TCP/IP protocol during week 3. All computers were divided into 2 groups, one manager and several workers. The manager is responsible for distribution of tasks (data) to workers and comparison of the results each worker sends back. The workers equally share the computational loads, relying on the data the manager sends to them. We tested the algorithm, in different labs, to see the optimum number of workers under this distributed-computation-like structure. Not only did we introduce a distributed structure into our simulation, also we managed to lower the computational load for each worker. We deleted a time-consuming function, saving a comparatively large amount of time, and changed the way we timed our algorithm to be more reasonable and precise. By the end of week 3, we eventually make the algorithm real-time, dealing with a 35-second audio file with 30 seconds. Luting Yang went back to China after week 3 and would return one month later. The work afterwards would be on me. After all, this is an independent project. From week 4, the project moved to hardware-related stage. It took a couple of days, in the first place, to fix the microphone array boards. Some of the microphones were out of work due to the microphone itself or bad soldering. Bad soldering on the boards caused ill functioning of amplifier. After the boards worked, Mr. Richter Ed helped me slightly change the Matlab code as well as LabView code and achieved getting the real-time DOA for every second under the distributed-computation-like structure.